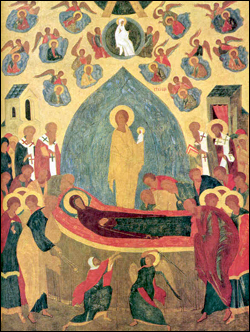 The feast of the Dormition is the last great feast in the Church calendar year. It is preceded by a two-week fast. The glorious lot of the ever-blessed Virgin in the work of God’s salvation of the world made all Her life wonderful and exemplary. After the Crucifixion of Christ, the Mother of God was taken to live in the house of Her adopted son, the Apostle John. Tradition notes than even after the descent of the Holy Spirit on the apostles, the Mother of God remained in Jerusalem, visiting those places where the Saviour of the world preached, suffered and died. She did not want to leave the country that was dear and holy to Her. When king Herod Agrippa began to persecute the Church, both the pagans and the Jews, indignant of the respect that the Mother of God was receiving from the Christians, wanted to kill Her. It was during this time that She traveled with Apostle John to Ephesus. Church tradition has this also as the time of Her visit to Cyprus to Bishop Lazarus, who had been raised from the dead after four days, and to Mount Athos. When the persecution ended, the Mother of God returned to Apostle John’s house at Zion in Jerusalem. Once, when She went to the Mount of Olives to pray, Archangel Gabriel appeared and spoke of Her approaching departure from this world. Upon returning home, She told Apostle John all that the Archangel had said to Her and started preparing Herself for Her final day on earth. Friends and relatives gathered, and eleven of the apostles were miraculously transported from various parts of the world to Her deathbed. They were all amazed to see each other there. When Apostle John explained that the Mother of God would soon be departing this world, they understood why God had brought them together and became sad. But She comforted them, saying: “Do not cry and darken My happiness with your sadness. I am going to My Son and your God, and you will bury My body and return each to your work.” As the time of Her death neared, the room shone with a divine light, the roof disappeared, and a wondrous sight appeared before all: the Lord Jesus Christ descended from heaven surrounded by many angels. All looked upon this wondrous sight with awe and reverence, and when they approached Her bed, the holy body of the Mother of God shone radiantly, and a fragrance of incense pervaded the room. The apostles carried the body of the Mother of God through the city to Gethsemane, to be buried at Her request in the tomb of Her family and Joseph. They buried Her body, closed the tomb with a stone and remained there at the site in prayer for three days. On the third day Apostle Thomas arrived and was very saddened that he did not find the Mother of God alive. To make him feel better, the other apostles rolled away the stone to let him pay his respects to the body. But on entering the tomb, they found that the body was not there – only the winding sheet. They returned home to partake of a communal meal at which they always left a place for the Resurrected Lord. After the meal, they raised the bread left for Christ aloft and exclaimed: “Lord, Jesus Christ, help us.” And they heard a choir of angels, and when they looked up they saw the Holy Virgin surrounded by angels. She greeted them, saying: “Rejoice, for I am with you through all the days.” Then the apostles were filled with joy, and instead of using the usual words, they exclaimed: “Most holy Mother of God, help us.” And now they understood and believed that upon the third day after Her dormition, the Mother of God had been resurrected. Thus, the dormition of the Mother of God is not a sad event, but a joyous one. Her death is but a short sleep, after which follows Her resurrection and ascension to heaven. From the very beginning, the Church saw in the Mother of God the One who would pray for all of mankind. She is the haven of all the mothers in the world. She teaches us how to live in total faithfulness to the will of God. She, who kept in Her heart the divine words, is an example of faithfulness, love and service. Blessed is God for having granted us this great day, in which from ancient times and with triumphant hymns the universal Church accompanies heavenward into supreme Zion the incorruptible body of the Mother of God together with Her soul, and allows us to take pleasure in the spiritual fragrance of Her indescribable holiness and in all the virtues with which She was endowed by the Holy Spirit and by the Son of God, Who had issued from Her by taking on human nature! With what tenderness, joy, and piety did the apostles and all the other elect enjoy the wondrous vision of the reposing Theotokos’ visage, all shining with heavenly light, and the indescribable heavenly fragrance of Her God-bearing body, and the contemplation of the brightest visage of Her Son and God, the Lord Jesus Christ, Who had come to take His holy Mother’s soul into His hands! O, this was a celestial vision on earth, never seen before! Even the heavenly angels were visibly present here together with their King and Master. Only three days did the Most-pure body of the Theotokos, buried by the apostles in Gethsemane, remain in the tomb, only three days did it stay there, and afterwards it was resurrected by the Lord and united with Her soul, and She was taken up together with Her body into heaven. For only three days was She fated to repose in the sleep of death, just as the Lord Himself remained in His tomb for three days and afterwards arose to confirm the universal resurrection of mankind. Death, having been vanquished by the resurrected Christ, became for the faithful a dormition, a passage, a step towards immortality and eternal life, provided we die in faith, repentance, and virtue. Let us venerate the Most-glorious Mother of God, higher than the heavens and purer than sunlight, Who delivered mankind from its curse, i.e. from God’s damnation. But what exactly is God’s curse? It is the consequence of God’s righteous wrath upon criminal, sinful mankind, so ungrateful to its Creator and Benefactor, for which it had been deprived of God’s mercy, eternally rejected from the face of God, condemned to the eternal torment of hell or to eternal death with the fallen angels, the evil spirits. Eve, our foremother, was responsible for this damnation together with Adam through the sin of disobedience – and even to this day its consequences continue to overshadow sinners who do not know God, their Saviour. But the Theotokos, through Her humility, obedience, meekness, God-like purity, acceptance of the Archangel’s tidings, and above all through Her wondrous bearing of the Son of God in Her womb, attracted God’s blessing upon the world by giving birth to the Saviour of the world and obtaining the benevolence of the Heavenly Father towards all the faithful. Another consequence of God’s damnation of mankind was death, but Christ, the Son of God, Who was born of the Theotokos in flesh, Who suffered and died for the sins of mankind, took upon Himself our damnation, vanquished our death by His death, and removed the curse from us by crucifying our sins on the cross and granting us incorruptibility, resurrection, and immortality. Such are the comforting truths which the feast of the Dormition of the Theotokos brings us: it assures us that Christ the Saviour, born from the Most-pure Virgin Mary, removed from us the curse of our sins and granted to all of us resurrection from the dead on the last day of the world. Is this not comforting for every Christian believer? And having such an expectation of a general resurrection from the dead, let us try throughout our entire life to become worthy of the glorious resurrection into eternal life by means of constant repentance, battle with our passions and the temptations of the flesh and the world, and strive for success in all virtues, in order to eternally enjoy the infinite, incorruptible, surpassing all understanding, all feeling and all expectation – the blessings of the Heavenly Kingdom, together with God, the Mother of God, the holy angels, and all the saints. Amen. The great and wondrous summer holiday - the Dormition of the Holy Mother of God - from olden times has been regarded by Orthodox Christians in the light of a second Pascha. Pascha itself - the Holy Resurrection of Christ - was a turning point in the history of mankind. With His resurrection the Lord Jesus Christ opened for us the gates of paradise, the gates of that place of bliss which was originally intended for man - the crown of all creation, and which became closed to us because of the sin of pride and disobedience to God on the part of our forebears. But centuries passed, and God Himself came down to earth, became incarnate in the form of man, and once again opened to us the gates of paradise, having manifested - instead of pride - the greatest humility, instead of disobedience - complete obedience even unto death on the cross, and instead of sin He - the most pure and absolutely sinless - took upon Himself the burden of all the sins of the world. With these three qualities - humbleness, obedience and purity of nature - the Lord showed us the highest example of what man can be like, of what he should be like, and of what the Creator intended him to be. However, we may well think, dear brethren, that only God incarnate, the Lord Jesus Christ, could be such an ideal man, while a mere mortal could never attain such perfection. But to show us the error of such thinking, we have before us the Mother of God, Who is the highest example of the attainment of such perfection, and Who teaches us with Her entire life and Her dormition that man can attain perfection precisely by means of these three qualities - humbleness, obedience to the will of God, and moral purity. The Holy Virgin was so humble, that she wished to be even the lowest servant of the maid who would become the Mother of God. The Holy Virgin was so humble, that having Herself become the Mother of God, She did not become haughty, but modestly performed Her great service. The Holy Virgin was so obedient to the will of God, that having heard from the Archangel concerning Her forthcoming service, so extraordinary and unknown to any mortal, She meekly replied: “Behold the handmaiden of the Lord.” The Holy Virgin was so obedient to the will of God, that having heard from the elder Simeon of the future painful torment to which Her heart would be subjected, She humbly accepted Her share in the sufferings on the cross of Her Son and God. Concerning the extraordinary purity of the Holy Virgin - we are presented with proof of it from Her very birth. How pure She must have been if the high priest led Her, a mere three-year-old child, and a female at that, into the holiest of holies! In the prayers before communion the Church warns us to beware of partaking of the Holy Mysteries while being in a state of uncleanliness, in order not to burn ourselves, for these particles of Divinity are fiery. How pure must have been the Holy Virgin, if She contained God Himself in Her womb and was not burned! The Gospel tells us that nothing unclean will enter the Heavenly Realm. How pure must have been the Holy Virgin, if She not only entered the Kingdom of Heaven, but having passed through the gates of death like all mortals, She was taken up into heaven together with Her body and placed right next to the Throne of the triunal God Himself! In the Dormition of the Mother of God, it is these three qualities of hers which are commemorated - humbleness, obedience and purity, - which have elevated Her, a mere mortal, above all earthly creatures and above the entire heavenly host, which have made Her more honorable than the cherubim and more glorious beyond compare than the seraphim, which have made Her the Queen of heaven and earth. Let us try, dear brethren, to emulate the high example of the Mother of God and, while celebrating Her wondrous holiday, let us remember that even in Her Dormition She never abandons us. Amen. From the Gospel account of how the blessed event of the Mother of God’s annunciation took place, we know that in response to Archangel Gabriel’s tidings that She had been chosen to become the Mother of God the Word incarnate, the Most-Holy Virgin humbly replied: “Behold the handmaiden of the Lord; be it unto Me according to thy word,” and gave herself over completely to the will of God. And now here She is with the righteous Elizabeth. And St. Elizabeth for the first time calls Her by the name with which afterwards millions and millions of the faithful would exalt Her. The righteous Elizabeth says: “And whence is this to me, that the mother of my Lord should come to me?” The Mother of God has come to me! And now all Christians glorify Her as the Mother of God. This was followed by the radiant joy of His resurrection, but soon there was the parting with Her divine Son, Who ascended into heaven. And although She knew His words about remaining with us to the end of time, nevertheless Her motherly heart was deprived of actually seeing Her beloved Son for many years. Finally there came the day of Her dormition. This was like a threshold to a new life, like a turning point in it. Before the dormition there was only humbleness and anonymity… Tradition has retained many accounts of how meek and humble She was, how She never put Herself forward in anything. She was filled with the grace of the Holy Spirit more than anyone else; however, She always humbled Herself, shunning all honors. But finally the time arrives for Her glorious dormition. Her Only-begotten and beloved Son appears and takes Her holy soul into His holiest hands. The dormition occurred… and soon afterwards, several days later, the assembled apostles suddenly saw in the air the Most-blessed Virgin Mary, now already the Queen of Heaven and earth, shining with celestial radiance and surrounded by piously standing and kneeling angels. And She kindly promised the apostles that She would be with them always. The words “the Theotokos Who is constant in supplications” indicate the fact that Her prayers stream forth continuously – prayers for the world, prayers for us; we know that the Lord affiliated St. John the Theologian, the great Apostle of love, to Her, and through him – all of mankind. Therefore, no matter how sinful we may be or how unworthy, we joyfully say that She is the mother of mankind and the Heavenly Mother of every one of us. Our celestial Queen and Mother commiserates in Her heart over each one of us, wishes eternal salvation for each one of us, and prays for all of us. Let us not forget that Her divine protection covers us all, and that continuously to the throne of God’s glory rise the prayers of the “Theotokos Who is constant in supplications”… Amen. The story of today’s feast of the Dormition of the Mother of God is so instructive, that it would suffice to present just a brief synopsis of it, in order for each person to learn a lesson from it afterwards. After the ascension of Jesus Christ to heaven, the Mother of God continued to live for a great number of years in Jerusalem, in the home of St. John the Theologian, who had been affiliated to Her as a son at the Cross by the Lord Himself. She loved to visit the temple of Jerusalem, the garden of Gethsemane, the Golgotha, the Mount of Olives, and other places that had been sanctified by events in the life of Her Divine Son. This was abhorrent to the enemies of Christ, and so they sent out soldiers with the order to hinder Her from going to these places, but the Lord miraculously concealed His Mother, and She went unimpededly wherever She wished. When the time came for Her departure from this world, She earnestly prayed to the Lord to take her up to Him and free Her from passing through the demonic frights. Three days before Her repose, the Archangel Gabriel appeared to Her and brought Her glad tidings about Her imminent repose, giving Her a wondrous paradisiacal branch as a token. As She prepared for Her imminent repose, the Mother of God wished to see the holy apostles, who had dispersed throughout various lands to preach Christ’s Resurrection, and so, miraculously brought back by angels, they gathered together in Jerusalem. Bidding them farewell and issuing Her last requests, She asked them not to weep, but to rejoice in Her departure for the heavenly dwellings. Suddenly the roof of the room opened up, and Jesus Christ appeared, surrounded by hosts of angels and saints. The Virgin Mary bowed before Him and lay down on Her bed. Christ took into His hands Her Most-pure soul, which is depicted on the icon of the feast as an infant, and ascended into heaven together with Her. Thus peacefully and painlessly ended the earthly life of the Mother of God, for death, according to the Word of God, is evil only for the wicked (Psalm 34:21). This was not even death as we are used to seeing it, but rather a light and pleasant sleep after righteous labors. For this reason the Mother of God’s repose is called not death, but dormition. The apostles raised the body of the Theotokos upon their shoulders and, accompanied by a multitude of the faithful with censers and lighted candles, proceeded towards the garden of Gethsemane where the Theotokos had asked to be buried. St. John the Theologian strode in front of the procession, carrying the paradisiacal branch brought by Archangel Gabriel, while overhead there appeared a cloud in the form of a crown, from whence angelic singing was heard, which blended in with the singing of the people. Such honor accorded to the Mother of the Jesus Christ Who was so hated by the scribes and the Pharisees agitated them and made them send out soldiers to disperse the people, kill the apostles, and burn the body of Mary. However, the overhead cloud descended upon the crowd and concealed all those who were accompanying the bier, while the soldiers themselves were struck blind. By God’s allowance only one Jewish priest, Athonius, was able to approach the bier, which he arrogantly tried to overturn. Straightaway an angel of the Lord cut off his hands with an invisible sword, so that they remained hanging from the bier. Bleeding heavily, Athonius fell to the ground in fear and entreated the apostles to help him. “The Lord Himself cannot help thee, if thou dost not repent from the bottom of thy heart and comest to believe in Him,” – said the holy apostle Peter. “I believe in our Lord Jesus Christ, Son of God, before Whom I have sinned heavily, and I worship His Most-holy Mother, the Virgin Mary,” – cried out Athonius in tears. Then apostle Peter ordered him to apply his wounded stumps to the cut-off hands, and immediately they became attached again, leaving just a thin ribbon-like trace. The slightly delayed procession, which now included the newly-converted Athonius, proceeded further. The apostles buried the Virgin Mary in the cave where Her parents and Joseph the Betrothed had been buried earlier, sealed the entrance with a large boulder, and remained there for three days, passing the time in continuous prayer. On the third day after the most glorious Dormition of the Mother of God, there arrived the apostle Thomas, who had not been present at Her repose by God’s special providence. 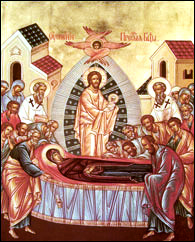 In order to comfort Christ’s bitterly weeping disciple, the apostles pushed away the boulder from the entrance to the tomb, in order to allow Thomas to venerate the body of the Most-holy, but great was their amazement when they noticed that the Theotokos’ body was no longer in the tomb, but only Her burial sheets remained. Then they looked upwards to heaven, as though seeking there an answer to their bewilderment, and suddenly they saw the Mother of God amid the clouds, surrounded by hosts of angels and saints. “Rejoice,” – She said to them. – “I will always be with you.” Bowing before Her, the holy apostles cried out: “O Most-holy Theotokos, help us!” It was clear to all that the Lord, having Himself arisen on the third day, had also resurrected His Mother, and that She now stands before the throne of Her Son and our God, praying for all Christians. With great joy the apostles bid each other farewell and were again miraculously transported on clouds back to the lands from which they had come. No one can take away from us, too, this joy of prayerful communion with the Most-holy Theotokos, and for this reason the church sings: “In giving birth Thou didst preserve Thy virginity; in Thy Dormition Thou didst not forsake the world, O Theotokos. Rejoice, O Joyful One, Who in Thy Dormition hast not forsaken us!” Amen.